There’s a busy week in prospect for the engineers at GPRM, the race-prep experts who are converting our Toyota GT86 into a production class racer with which to contest Britain’s toughest track event, the Britcar 24 Hours at Silverstone over the weekend of 22/23 September. 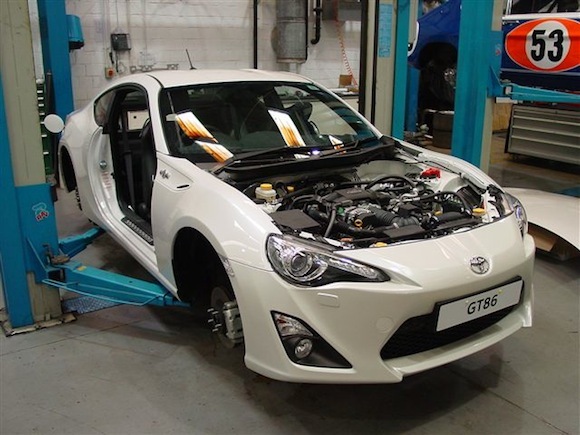 The GT86 was delivered to GPRM’s Buckingham workshops as a complete road car, and has been painstakingly disassembled to allow the fitment this week of a safety roll cage. 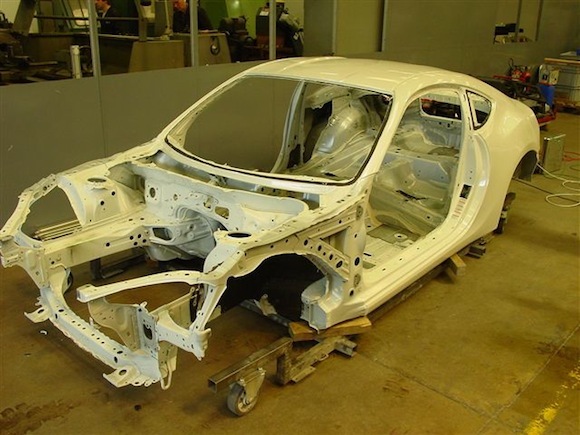 This vital piece of equipment has a dual function – not only does the welded steel structure protect the driver in a high-speed accident, it also adds rigidity to the bodyshell, which will aid chassis set-up and handling. The roll cage has been designed, engineered, fabricated and fitted by GPRM, and once installed will be certified by the MSA, British motorsport’s governing body, that it is to safety standards laid down by the FIA. The other major job for this week is the fitment of the specialised safety fuel cell to replace the standard fuel tank of the GT86. Made by ATL, the new tank is a seamless ‘bladder’ encased in toughened steel – the aim is to ensure that no fuel will spill in an accident. Fewer stops to refuel means less time lost in the pits, so the racing GT86 tank holds 120 litres as opposed to the 55 litres of the standard road car. A “quick fill” refuelling system will feature, to enable the tank to be replenished as quickly as possible and with maximum safety during the race. After this work is complete, the GT86 shell will be off to a nearby paintshop for an all-over respray. Very cool, looking forward to the next instalment.